Today's recipe can be made by kids too. You just need 3 ingredients and a sweet treat is ready for you and your kids. Great snack for parties, specially for kids parties. This simple and delicious recipes goes to the 2nd day, week 4 of BM 59 under the theme Kids Delight- Party Pleasers ( finger foods). Wash and pat dry fresh strawberries. In a microwave safe bowl add chocolate chips and run it for 15 seconds. Give it a stir and dip each strawberry into it, so that half of the strawberry is coated with chocolate. Add some sprinklers on top. Let the strawberries rest for sometime so that the chocolate dries up completely. You can even refrigerate them for few minutes. Check to see what my fellow bloggers are cooking for BM 59. 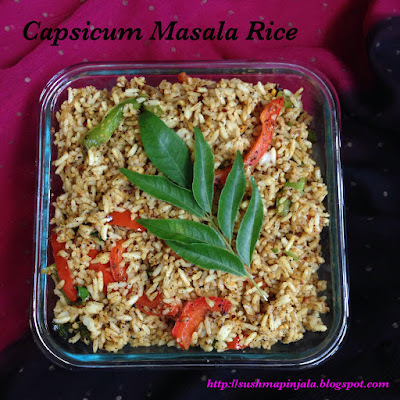 Also sending this recipe to Srivalli's Kids event hosted by Priya Srinivasan for this month. Today we are starting with the final week for BM 59 and most importantly we are in the last week of the year 2015. Soon we are going to enter into New Year with new goals and resolutions. We have started our celebrations with Christmas Eve Party in our apartment complex. Me along with another 5 families wanted to give a surprise party to our kids today. We had potluck party with lots of yummy food. I choose to bake cupcakes which are kids all time favorite. Wanted to make these cupcakes in a healthy version so I have used Whole wheat flour instead of regular all purpose flour. This recipe goes to the first day of week 4 of BM 59 under the theme Kids Delight- Party Pleasers (finger food). Mash banana in a bowl and keep aside. As the Christmas holidays are approaching kids are making their plans for their play dates and sleep overs. Kids love to have cookies, chips and chocolates and what not. Being a stay home mom, I always love to cook something exciting and new for my kids. Not only me but I guess most of the mom's feel very happy when your kids and family love and appreciate your food. Saw this easy and delicious butter cookies recipe in one of my friends place and wanted to give it a try. With few modifications made these Butter cookies with a touch of pistachio flavor. My kids are picky eaters and not a big fan of eat nuts in their daily diet. So I have added some pistachio powder to the cookie mixture, believe me or not kid's didn't even know that I have added some nuts to the cookies. Now these are a big hit in my house. Today's recipe is one of the simplest recipe which can be made in no time. Just roast the masala ingredients make a powder, combine with rice and cook. Found this interesting recipe in Sanjay Thumma's Vahrehvah.com Very simple and flavorful dish with very few ingredients. If you have any left over rice from the previous day or got bored of having the same old rice and curry for lunch. Make this flavorful dish and enjoy your dinner. In a small pan heat 1 spoon oil and add cumin seeds and udad dal (black gram). I am a big fan of spicy food, specially when it comes to Chinese and South Indian food. Made this dish couple of month ago when my family was craving for Chinese food. Kids wanted noodles, so made hakka noodles for them and Spicy Schezwan Fried fried rice us me and hubby dear. As I had some Cauliflower in my fridge, made Gobi Manchuria along with sweet corn soup to make it a complete Indo-Chinese meal. Schezwan Fried Rice is a Indo-Chinese dish, which I made with home made Schezwan Sauce. If this sauce is ready and handy to you in your refrigerator you can make this spicy and delicious fried rice with in few minutes.Very easy to make with very few ingredients.I have made this a veg version, but you can also add cooked chicken, eggs, shrimp and any other meat too. This is the perfect dish for lunch or dinner who loves to have spicy food. Here goes this dish to the 2nd day, Week 4 of BM 58 under the theme "Rice Dishes". Today we are starting with 4th week of Blogging Marathon 58. My theme for the week is "Rice Dishes". From savory items to sweet dishes there are thousands of recipes which we can think of making with rice. Rice is widely consumed staple food for large part worlds human population, specially in Asia. Rice is cooked by boiling or steaming. Rice is cooked plain and served with any vegetable curry or Non veg curry. Rice is also cooked along with some vegetable, meat and fish with some spices to flavor to the rice. They are either called Pulao, Pilaf or Biryani. For day 1, am here with Sindhi Style Chicken Dum Biryani. Rice is layered along with chicken curry which is cooked with some spices and potatoes. 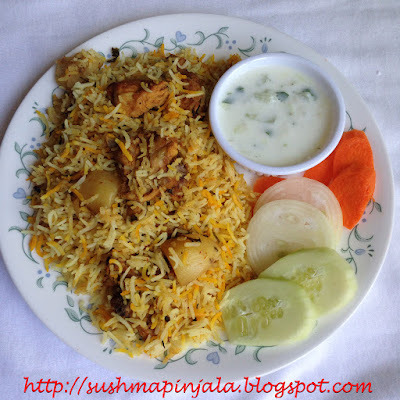 Biryani is one of our family favorite and made at least twice or thrice a month. This recipes goes to BM 58, Week 4, day 1. For day 2 under the theme "Tea Time Snacks" am here with a crisp and crunchy savory snack to munch on with a cup of hot tea or coffee. As the festival season is going on have made this Poha Mixture to serve my friends. Very simple snack which can be made in minutes. Here goes the recipe.. In a large pan dry roast poha. On a medium flame keep stirring poha till it become nice and crisp. Transfer to another plate and let it cool down. In the same pan add 1/2 spoon oil and add peanuts. Fry till nice aroma come out. Remove and add red chili, curry leaves and roasted chana dal. Fry for 3 to 4 minutes on medium flame till crisp. Now add haldi to the mixture and mix well. Transfer poha to the pan and add salt, chili powder and amchur powder. As nutella is very thick, first will add milk to it and make it a semi liquid mixture. Now add heavy whip cream and fold it well, do not mix it in a circular motion. I have used store bought brownie mix to prepare Brownie. Once the brownie is baked and cooled down spread the nutella syrup on top. Top it with whipped cream and and serve. Tilapia are mainly freshwater fish inhabiting shallow streams, ponds, lakes and rivers. Whole tilapia fish can be processes into skinless and boneless. They have very low of mercury as they are fast growing, lean and short-lived. Tilapia are low in saturated fat, calories and sodium and are good source of protein. Today I have made a delicious fish curry with Tilapia. This simple and yummy curry is my family favorite dish. So this curry goes to day 3, week 2 of BM 57 under the theme "Side Dishes". Tastes best with plain rice or any flavored rice. You can use any kind of fish, but this tastes better with tilapia. I have taken 4 fillets, cut them into 2 inch pieces. I have got around 16, 2 inch pieces. Calabash or Bottle gourd or lauki is vine grown for its fruit. Fresh fruit has a light green smooth skin and white flesh. The North Indian popular dish is Lauki Channa. The juice of Bottle gourd is considered to have medicinal properties and to be very good for health. Cut Bottle gourd into small pieces. Heat oil in a cooking pan and add mustard seeds. Once the mustard seeds start splattering add cumin seeds, curry leaves and chopped green chili's. Saute for a minute and add chopped onion. Fry till the onions turn light brown. Boil eggs, remove the shell and keep aside. In 1 cup water add cashew nuts and poppy seeds to boil for 15 to 20 minutes. This process with make the paste very smooth. In a pan heat 1 spoon oil and add chopped onions. Fry till golden brown and let it cool. Now add boiled cashew nuts, poppy seeds and onion to blender and make it to smooth paste. Cut eggplant into thick slices. Add salt mix and leave the pieces in colander for 20 to 30 minutes. Pat the eggplant pieces with dry paper towel and keep aside. In a bowl add flour and salt to taste. Add little water at a time to make a smooth batter. Kyopolou is a popular Bulgarian and Turkish spread made from roasted eggplant and garlic. Other ingredients used are red bell pepper, onion and tomatoes. Hot peppers can also be used if you like spicy relish. Taste can vary from hot to sweet. This dish is generally made as a canned food for the winter season. Clickhere for the original recipe. As said in my last post eggplant is widely used in Turkish and Indian cuisine. Kyopolou is similar to our Indian chutney / dip which is usually made in Southern part of India. Only thing is we add some tempering to the paste / chutney at the end before serving. Wash all the veggies thoroughly. Apply little oil on eggplant, tomato and bell pepper. Today we are starting with 57th edition of Blogging Marathon. I choose a very interesting theme for the first week- cooking with Eggplants. Eggplant or aubergine is a species of nightshade grown for its edible fruit. This is known as Brinjal in Southeast Asia and South Africa. Eggplant is used in cuisines of many countries, it is widely used in its native Indian Cuisine. It is often stewed as in French Cuisine or deep fried as in Italian cuisine.Eggplant is also used in Turkey and middle eastern countries too. Eggplant is also used in some parts of North America, specially in Georgian Cuisine. Ajapsandali is a vegetable stew made with eggplant and other veggies in large quantity during autumn and preserved for winter. This dish brings warmth and comfortable atmosphere for a cold winter day.